Nashua Fuel is a locally owned Fuel Delivery Company supplying New Hampshire. Fuel Delivery For #2 Home Heating Oil and On and Off Road Bulk Diesel Gasoline, Driveway and Parking Lot Repair, Crack Repair, Paving, Demolition and Dumpster Rental and Waste Removal Service. Nashua Disposal and Demolition is an independently owned and operated dumpster rental, waste removal and demolition company. Nashua Disposal and Demolition provides Roll Off containers (dumpsters) rental throughout southern NH as well as demolition services including commercial, residential and industrial. Nashua Seal Coating is committed to providing professional asphalt maintenance services to our customers by taking pride in our work and offering competitive pricing. Nashua Disposal and Demolition is an independently owned and operated dumpster rental, waste removal and demolition company. Nashua Disposal and Demolition provides Roll Off containers (dumpsters) rental throughout southern NH as well as demolition services including commercial, residential and industrial. Our experienced demolition team has the skills and experience to demolish and tear down your building fast and effectively including hazardous situations and asbestos. Whether you are a homeowner or a commercial customer, we have an affordable solution for even the most challenging jobs. 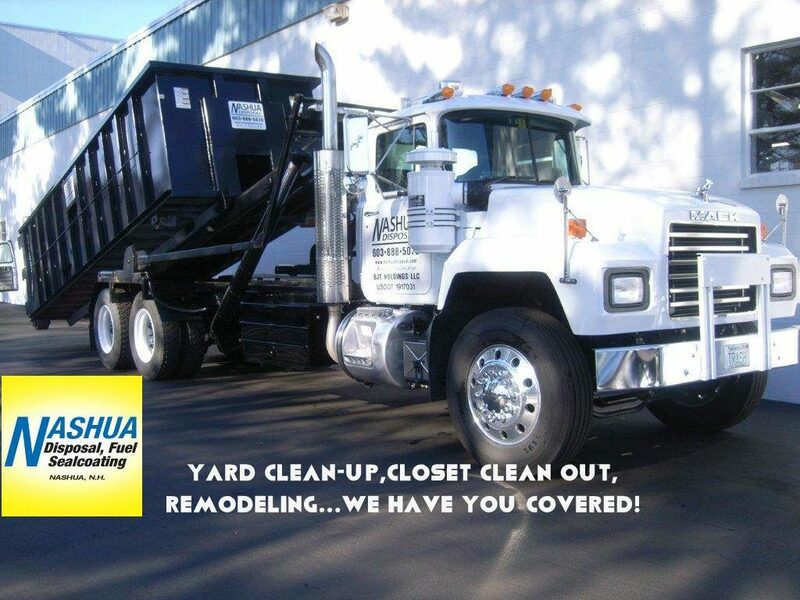 Our friendly team is happy to meet all of your demolition and trash removal/disposal needs and can recommend a program that is right for you. Whether you are in need of demolition, require a dumpster delivered immediately for an emergency project, or want to schedule a swap out we can help. Nashua Seal Coating is committed to providing professional asphalt maintenance services to our customers by taking pride in our work and offering competitive pricing. We are dedicated to providing the most courteous, professional and ethical asphalt maintenance service available anywhere. Our attention to detail before, during and after our projects is unmatched in the industry. Beyond just seal coating, Nashua Seal Coating uses hot fill rubberized crack filling. Crack filling seals out water and ice extending the life of your asphalt surface. Protect your driveway or parking lot beyond just looking good. Your Nashua Seal Coating team just finished the job. The results are just fantastic. Every one of them paid such strict attention to detail…very professional, and courteous. 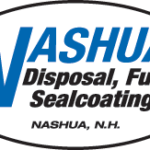 I’m so pleased with the job, and will not hesitate for a moment to recommend Nashua Seal Coating when I’m asked about it…and I’m sure they will. Please extend my sincere appreciation and thank you, to your entire team, for the fantastic job you did on my driveway. I was so impressed when I returned home to see that your team protected my garage, cement and rock walls, and brick walkways from overspray by utilizing protective paper and tape. The driveway looks wonderful!! Please let the team know that I think they did a fantastic job. Sign me up! My neighbor raves about the job you did. 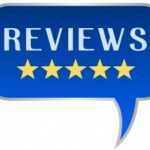 These are just a few of the many positive reviews and testimonials we have received for the services we offer! 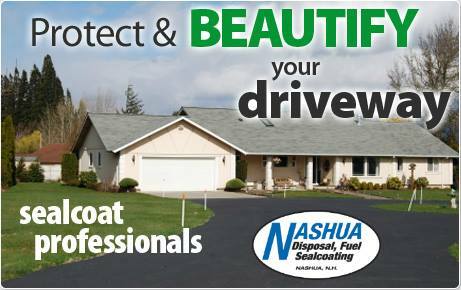 Welcome to the new home of Nashua Disposal, Fuel and Seal Coating! © Copyrights NASHUA DISPOSAL, FUEL, SEAL COATING 2017. All rights reserved.